If you live in Ireland and are at all interested in food, chances are you’ve heard of Donal Skehan, a rising star on the food scene. At only 23 years old, he’s already been blogging for three years at The Good Mood Food Blog and has published a cookbook. Television appearances include Ireland AM, the RTÉ Afternoon Show and Nationwide in Ireland and Market Kitchen in the UK, where he cooked his mojito chicken. In addition to his blog, he’s also a talented food photographer (he took many of the photos for his book) and writes for Irish Tatler magazine and The Cork News newspaper. Last month, he was in Paris cooking for 700 people at Veilleé Foodstock and returned to Ireland in time to scoop the Best Food/Drink Blog award at the Irish Blog Awards. But there’s more! Donal also sings in the pop band Industry, which has had two number‐one singles since their debut in 2009, and was a finalist in the Eurovision song contest in 2008. The quote on the cover of Donal’s book from RTÉ says he’s Ireland’s answer to Jamie Oliver, but at the rate Donal’s going, Jamie Oliver should watch out — there’s some stiff competition snapping at his heels across the Irish Sea. Donal says this is a quick all‐in‐one dinner that can even be prepared ahead of time and then just banged into the oven, making it a perfect midweek supper. Donal’s original recipe calls for 3 fl oz (90 ml) red wine, but I used chicken stock simply because I tend not to have red wine in the house. Preheat the oven to 425°F (220°C). 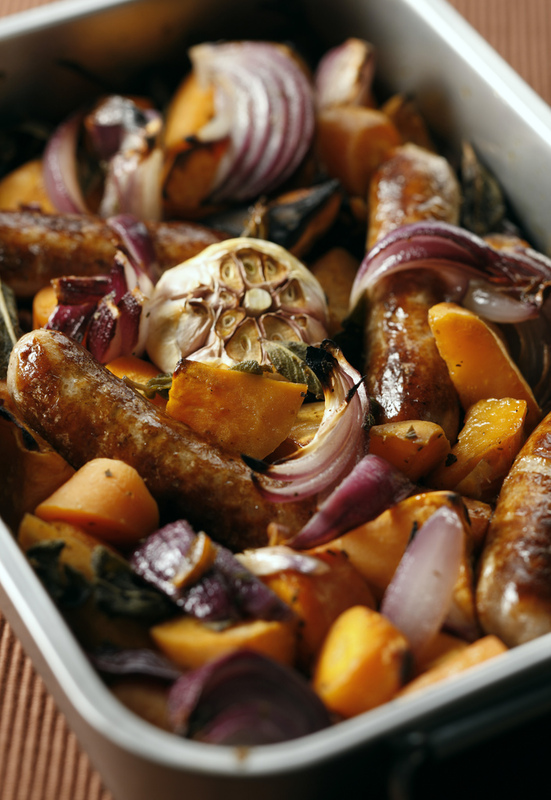 Arrange the sausages in a roasting tin or casserole dish with the sweet potatoes, carrots, red onions and garlic, making sure not to overload the tin. In a measuring jug or bowl, mix together the chicken stock, mustard powder, honey and oregano. Pour the stock mixture over the sausages and vegetables, tossing to make sure everything is coated with the stock. Season with salt (adjust according to how salty your stock is) and pepper and toss again. Scatter over the sage leaves. Roast in the oven for 45 to 55 minutes. Serve straight from the roasting tin, making sure to spoon over any remaining juices.